In 1914 the European powers comprised, in the centre, the Empires of Germany and Austro-Hungary and on its flanks, Imperial Russia, Britain and France. Germany, in particular, had shown signs of expansionism with threats to the East, ambitions to rival Britain’s sea power and a desire for an overseas empire. 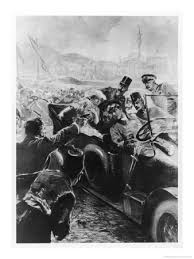 On 28 June 1914, Archduke Franz Ferdinand, heir to the Austrian throne was assassinated in Sarajevo by a supporter of the independence of Serbia under supposed threat from Austro-Hungary. There followed a month of negotiations before, on 28 July, Austria declared war on Serbia and attacked Belgrade. The situation rapidly deteriorated as the Russia mobilised to support Serbia as a fellow Slavic state. On 1 August Germany declared war on Russia. France had an Entente Cordiale with Russia with the result that France also mobilized. On 4 August, Germany launched an attack on neutral Belgium with the aim of first eliminating France before concentrating on defeating Russia. Britain, having guaranteed the integrity of Belgium, sent the German Government an ultimatum. This referred to the solemn undertaking of all the major powers to respect Belgian neutrality. This ultimatum expired at midnight on 4 August and Britain was at war with Germany.